This was a good challenge! After finishing the ribbed brim, I took another week to figure out how to pick up and knit the middle section with the cable. And after I finished all of that, I figured how to join the first and last row of the cable section, then pick up and finish the top. I learned that I really hate picking up and knitting. Who knew that gauge swatches were so important to a project? I’ve always been kinda ‘meh’ about testing my gauge, but I guess I’ve never been so off with a project in the past. 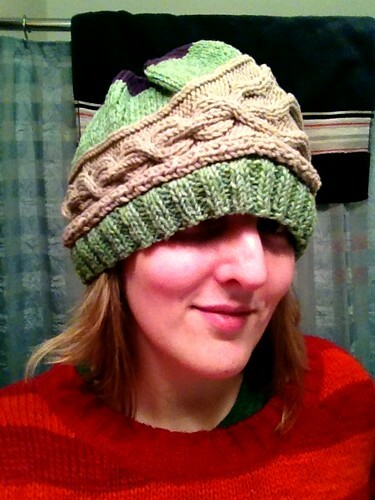 This hat turned out to be ridiculously huge, so I haven’t yet donated it back to charity. I’m planning to rip it apart and make a different hat. Hopefully one that will fit a normal human head. This was very easy, mindless knitting. I could finish a square in about 4–5 hours, which isn’t terrible since I was working on multiple projects at the time. (Okay, I still am…) Seaming all of the blocks together at the end is a different story. 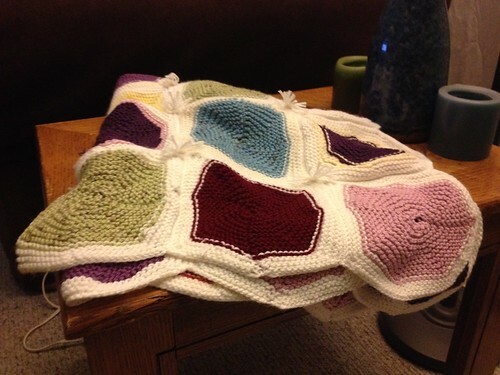 I’m happy I did this project, but I’ve since learned of more efficient patterns to knit blankets with this same look. Quick and painless! 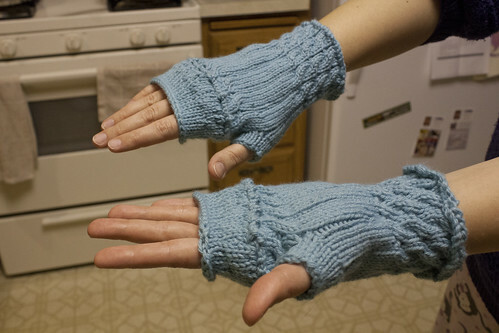 I didn’t knit enough to cover my knuckles as much as I would have liked, so I picked up along the top edge and added more stitches with a slight decrease to help keep some warmth in the mitts. During this process, I discovered that I had actually used four needles holding 15 stitches each to cast on 60 stitches instead of reading the pattern properly to see that I should have only used three needles with 15 stitches each (45 stitches total)… so these are a little roomy around my palm. They still turned out very nice. 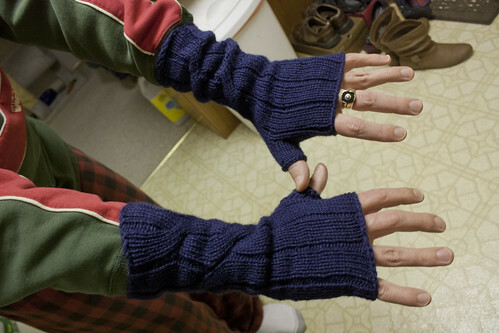 I cast on the correct number of stitches for these guys and they fit Jason like, well… gloves! They are sort of strangely long on his wrists, though, so I might eliminate a cable twist or two if I used this pattern again. This is when I learned my lesson to always bring a small project along on days when I’m working at the yarn store. Because I didn’t on the day that I picked out this project. I was flipping through the winter issue of Knitscene, wanting to make everything I saw, when I saw this. 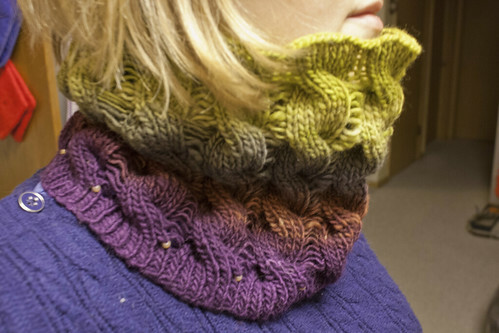 It only needed one skein of yarn and that is such a good excuse to splurge a little on some lovely Malabrigo! It was also fun learning how to use beads in knitting. I am wearing this as a type right now! I literally knit this in three days. I have never done color-work like this before and it was a good project to try it out with. I want to do more! 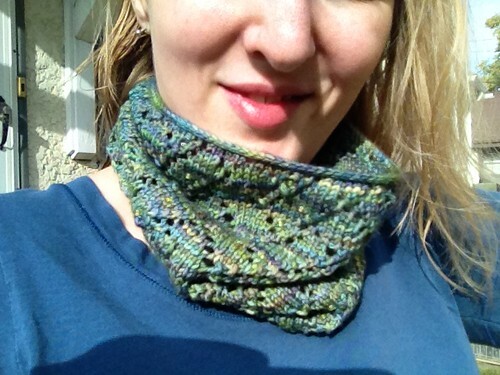 This is a project I picked up from last year’s yarn shop hop. It’s small and compact enough that I thought it would be a good one to try out during my re-introduction to bus commuting. I got over my fear of trying to do cables on the bus (I thought I would be dropping cable needles everywhere) and completed this project in about a month. I wear it very often — it keeps me warm! And I’m all caught up on reporting finished objects! 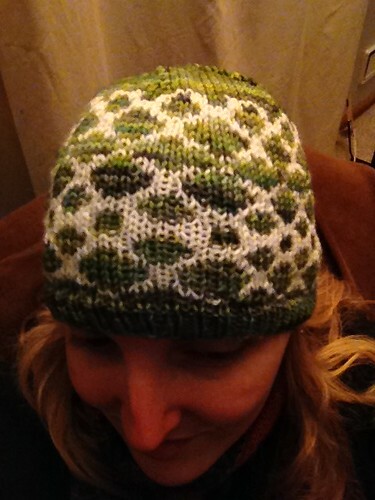 My knitting fever has definitely picked up since I started my part-time gig with the yarn store.